Remove mushroom stems, chop, and set aside. Place mushroom caps on a baking sheet sprayed with nonstick spray. Bake in the oven for 8 minutes. Meanwhile, break each stick of string cheese into thirds and place in a food processor or blender -- blend at high speed until cheese takes on a shredded or grated consistency. (Or just tear string cheese into pieces and roughly chop.) Set aside. Remove sheet from the oven but leave oven on. Blot excess liquid from mushroom caps and set aside. In a small bowl, combine crushed tomatoes, garlic, and Italian seasoning. Mix well and equally distribute between mushroom caps; spread until smooth and even. Sprinkle shredded/grated cheese over the saucy layer on each cap. 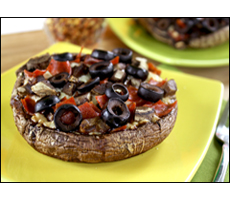 Top with chopped mushroom stems, pepperoni, and olives. Bake in the oven for 8 - 10 minutes, until cheese has melted. Eat as soon as you can without burning your mouth! HG Alternative! Don't like olives? Not into turkey pepperoni? Don't use 'em! Each standard saucy 'n cheesy mushroom "pizza" has 89 calories and 2.75g fat, so feel free to pick your own toppings and add their stats to those numbers. No, this isn't REALLY a pizza, but it is full of pizza-ish goodies. You will FLIP over how delicious (and tremendous!) it is. YAY!!!! Using a blender or food processor, grind cereal to a breadcrumb-like consistency. Set aside. Slice about 1 inch off the top (stem side) of the eggplant. Halve the eggplant lengthwise. Carefully cut along the inside of each half, about 1/2 inch from the skin. Scoop out the insides with a spoon, and chop them into small pieces. Place the hollow eggplant shells, cut-side up, on a baking sheet sprayed with nonstick spray; set aside. Bring a large skillet sprayed with nonstick spray to medium-high heat on the stove. Add chopped eggplant, onion, and peppers. Stirring often, cook for 7 - 8 minutes, until soft. Transfer to a bowl and let cool slightly. Add half of the cereal crumbs (about 2 tbsp.) to the bowl; place the remaining half in an airtight container or sealable plastic bag, and reserve for another time. 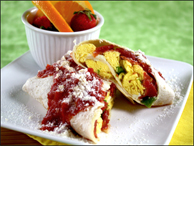 Add all other ingredients except crushed tomatoes and string cheese to the bowl. Mix thoroughly. Equally divide between the eggplant shells, lightly packing down until even. Bake in the oven for 35 minutes. Then remove but keep the oven on. 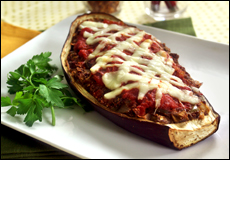 Spoon 1/4 cup crushed tomatoes evenly over the top of each stuffed eggplant shell, and lay string cheese pieces over the crushed tomatoes. Return to the oven for another 10 minutes, or until cheese has melted. Let cool slightly and then cut each piece in half. Now enjoy! HG FYI... That's two servings seen in the photo above, but get this: You can have the enormous amount pictured for just 340 calories... Woohoo! No ordinary crusts here, humans! Dan's Snazzy Green Pepper Pizzas - Our original veggie-bottomed pizza. Find this one within the pages of Hungry Girl 200 Under 200... So good! Pizza! Pizza! Egg Mug - Pizza in the morning, pizza in the evening, pizza at suppertime; When pizza's in an egg mug, you can have pizza anytime! Bring on the Breakfast Pizza - Look again -- that's not a bready pizza crust. If you've got our very first cookbook, whip this thing up! All-New HG 1-2-3 Exclusives! Our brand-new, New York Times bestselling cookbook, Hungry Girl 1-2-3: The Easiest, Most Delicious, Guilt-Free Recipes on the Planet, has no fewer than THREE quirky pizza recipes: Smothered Pepperoni Pizza Breakfast Burrito (the name pretty much says it all), Pizza-fied Chicken (guess what makes up the crust?! ), and Bowling for Pizza (with a delicious, protein-packed surprise)! Just a reminder: April is National Food Month. Have you been eating food? Well, congratulations! You've been celebrating all month long. Keep the party going with our new pizza-inspired veggie recipes! We should probably ALL be eating more vegetables. Click "Send to a Friend" to make sure your pals are eating theirs!